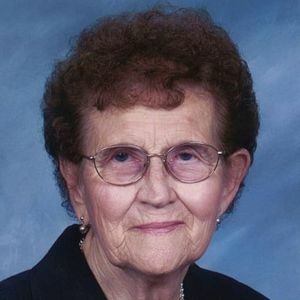 Marjorie Fern Pannkuk, age 94, formerly of Titonka, Iowa, met her Lord and Savior on April 8, 2019. She passed away at The Bridges of Ankeny, where she recently moved to be closer to family. A funeral service will be held Saturday, April 13th, 11:00 a.m. at Ramsey Reformed Church, Titonka, Iowa. A visitation will be held one hour prior to the service also at the church. Marjorie was born August 22, 1924 to William and Lena (Greenfield) Huisman in Kamrar, Iowa. At age 16, she moved with her family to a farm near Titonka. She caught Irvin Pannkuk's eye. They were married March 24, 1943. Farming was their life and livelihood. Irvin and Marjorie were blessed with five children, Loren, Stuart, Nola, Regina and Brian. Marjorie was a devoted wife, mother, grandma and great-grandma. Not only family, but friends, farmhands, repairmen, and salesmen enjoyed Marjorie's meals and baked goods. Mom loved gardening, which meant everything was fresh and homemade! Little did we realize or appreciate that every meal was a feast. After Irvin passed away, Marjorie left the farm and moved to Webster City. She volunteered her time reading to children at the elementary schools. Her church, Missionary Alliance in Blairsburg, gave her opportunities to serve. Her neighborhood experienced Marjorie's gift of hospitality. And her grandchildren would say "Staying with Grandma was the best!" Marjorie is survived by her children; Loren (Donna) of Pella, Stuart (Tanya) of Webster City, Nola (Steve) Ryan of Ankeny and Brian (Denise) of Las Vegas; grandchildren, Tami Nelson, Angie Pannkuk, Kim Christianson, Justin Pannkuk, Christopher Ryan, Courtney Lienemann, and Chad Ryan and 15 great-grandchildren and two on the way; her brother Ronnie and sister-in-law DeAnn and many nieces and nephews. She was preceded in death by her husband, Irvin, her infant daughter, Regina Rae, her daughter-in-law, Connie Pannkuk and her grandson, Brent Pannkuk. Memorials may be made out to Ramsey Reformed Church or Ethos Missions (formerly NewTribes Mission). And I just want to thank you for the lovely things you've done. You are his lovely mother, I am his lucky wife. You raised in love a little boy, and then gave me a man. Walk with God in peace, Mom. We love you! My deepest condolences go out to the Pannkuk family and to all of those that loved and will miss this wonderful woman I knew as Mrs. Pannkuk. May her soul rest in peace with our Lord in Heaven and may He comfort and bring peace to those who mourn.